Are You Protecting Your Appliances and Electrical Equipment Correctly? The damper in your chimney is the fireplace component that you open before you start a fire, and you close afterward (this is to keep your home as energy-efficient as possible). Eventually, you might notice that the damper won’t open or close any longer. This is obviously a frustrating issue, but actually may not be all that serious. In fact, many times repairing the damper makes a DIY-suitable project. If you run into any problems, do reach out to us! It’s important to start with a clean fireplace. 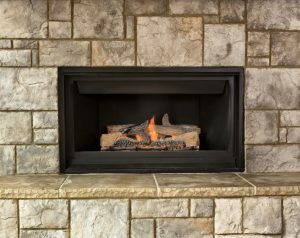 From there, you can locate the damper at the top of the fireplace, and clean it. It’s likely you’ll need to lay on your back to do so, so it’s essential that you take protective measures such as wearing a mask and protective glasses. If your damper is stuck, you may want to try applying some WD-40 to loosen it up. In some cases, however, it ends up that the damper needs to be replaced. Perhaps you’re worried about using your fireplace due to an issue with the mesh screen you use to protect your home from soot, sparks, and smoke. You certainly shouldn’t continue using your fireplace if this is the case. But you may be able to simply ask for a cut of screen in the same size from your local hardware store! Okay so here’s the thing. If your chimney is seriously deteriorating, and if the mortar isn’t held together like it should be, it’s absolutely time to call in a pro. A deteriorating fireplace or chimney will require complex work that an amateur or DIY-er simply can’t manage. Our pros have the right tools for the job, and not handling it correctly increases the risk that a fire will spread into or around your home. In aging homes, there may come a time where another repair simply won’t cut it. In order to get the best performance from your fireplace, and to reduce the risk of a house fire, you may need to replace the fireplace altogether. Our pros are here for the job, so don’t hesitate to reach out.